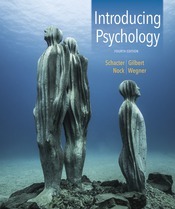 Changing Minds: Chapters end with questions on common perceptions and misperceptions about psychology. Check out these questions from Chapter 3. Learning Outcomes: Appearing alongside chapter text, Learning Outcomes are unique in that they do not solely focus on basic or definitional knowledge -- The authors want students walk away with an integrated narrative about the story of psychology. Check out this sample from Chapter 3. Data Visualization Activities: Available in LaunchPad, the new Data Visualization Activities for Psychology help students develop quantitative reasoning skills in each chapter by asking them to manipulate data in an interactive graph. Try the Data Visualization Activity from Chapter 7, Learning, "Do Learning Styles Exist?" Other Voices: These thought provoking, article-style pieces dive deeper into chapter topics. Check out this Other Voices piece by Ted Gup from chapter 15.